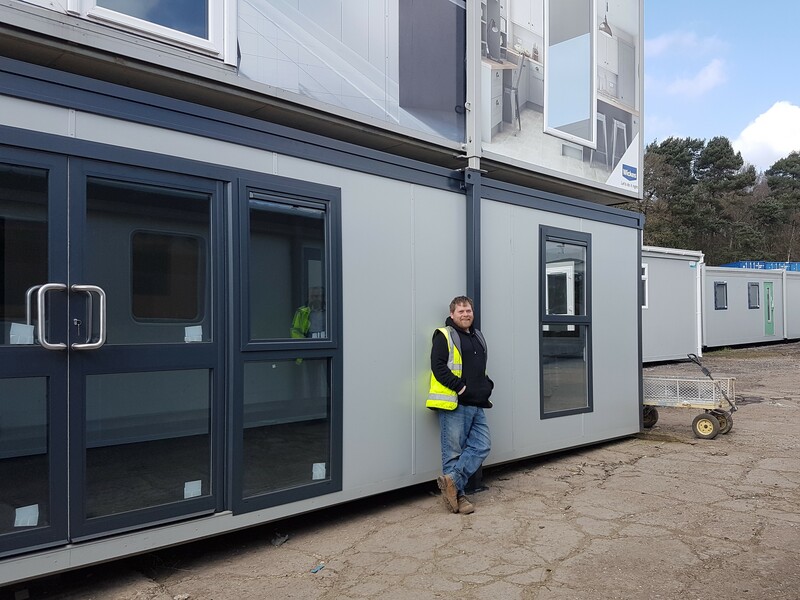 The phrase ‘we can rebuild it’ has taken on a whole new meaning at Derby depot where old, dilapidated cabins and pre-loved portable offices are transformed into shiny, new cosy units for a variety of purposes. At the cornerstone of these transformations is Scott Grainger, Yard Foreman of Derby office, who leads his 30 strong yard team into battle against rotting wood, damp, outdated and previously neglected cabins. Scott joined Portable Offices’ Derby office seven years ago on a temporary basis to lend a hand in the yard. At that time there were four other yard staff and relatively few cabins requiring their attentions. He was a qualified bricklayer and joiner and had no experience of portable units. Scott explains: “Initially, I thought these were rather dull and uninspiring spaces, but after getting involved in the refurbishment of my first cabin, I had a ‘light bulb’ moment and these units started to capture my imagination and I saw the possibilities. Seven years on and Scott is now Yard Foreman and has a team of 30 people reporting to him. His role requires excellent organisational skills as he has to ensure the refurbished units receive a high quality, fast-turnaround and are ready to be shipped out all round the UK. During winter when there is less pressure, Scott works from 8am to 5pm but when the yard is at its busiest in the summer, it is more likely to be from 7am to 7pm. “I don’t mind the hours as I need time when the rest of the team has left, to plan the workload, order materials, design the layout and literally work out the logistics. We work closely with the team management and work alongside the office and sales team who are pricing up for clients. “It is a constant cycle and seeing the units go from an outdated 70’s cabin to a slick, shiny portable unit worthy of any application, really does give us great satisfaction; there’s just so much that you can do with them. “I am lucky to have a great team to work with and the management are incredibly supportive; providing excellent training,” Scott explains. Scott’s son has joined the team and is receiving college tuition in electrical management as part of his on-the-job training.